We offer Quality not Quantity puppies at a very reasonable price! * What is Full AKC Registration? Full registration gives you full rights to your new puppy for show and for breeding. You own the dog with full rights for show and breeding. ** What is Limited AKC Registration? When you purchase a puppy at the Pet Only price it will have limited registration and you will not have show or breeding rights. This means that you will be required to spay or neuter your new pet. There is a $300.00 deposit to hold your puppy; this deposit will be subtracted from payment. This is a non-refundable retainer / deposit. The cost of shipping is $450 (not included in above pricing), shipping includes airfare, health certificate, crate, bed, food & water bowls for crate, collar, leash and blanket. I use Continental Airlines (Pet Safe Program) and also American Airlines. All of my puppies come with their dew claws removed and vet/health check, 1st and 2nd boosters and are wormed on schedule (from 3 weeks of age). They also have a 1 year guarantee by signed agreement. 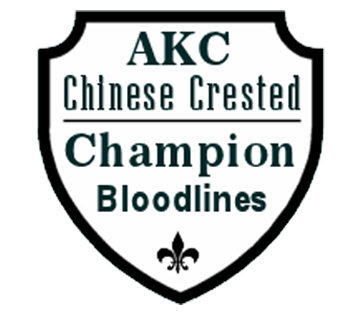 Ridgelake Chinese Crested puppies are all AKC Champion Bloodlines and AKC Registered.